Ever since the iconic Zippo lighter was introduced back in 1933, its users have applied cool routines to open and close it. From GI's killing time during WWII to Hollywood actors adding some flavor to their characters, Zippo lighter tricks have always been a sure way to boost your personality by adding some class and style. However, it wasn't until 1996 that the art of performing these tricks started to evolve beyond the basic moves previously seen. This video presents a selection of 50 popular tricks including everything from one hand wonders and spins, to aerials and duo tricks (performed by two tricksters). Alex Aarvik (Norway) teaches you 50 selected tricks including the legendary Goofy Style series. Each trick is filmed from 2 different angles plus a walkthrough and slow motion. In addition to the tricks, we have also included 24 basic movements and techniques that will serve as a good entry point for the rookies. 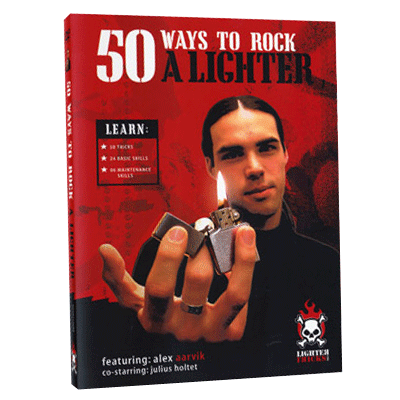 Learn basic maintenance that will keep your lighter in tip top tricking condition.